What Are the Best Grass-Fed Ghees to Buy? I went out looking for what are the highest rated & most recommended grass fed ghee products to help you use a good alternative to butter. Ancient Organics makes 100% organic ghee from grass fed cows. This product is hand-crafted using an open flame. The ghee itself is made in small batches, guaranteeing freshness and flavor. Each 32-ounce jar is specially crafted to have a longer shelf life, ensuring freshness at every use. The quality of Ancient Organics products is unmatched due to its long and slow clarification process. This company is extremely proud of their product, promoting the ghee to be one of the highest sources of CLA due to the use of the highest quality organic butter. This tasty ghee has a delightful aroma and leaves no unpleasant aftertaste. Some ideas for use: can be used as a substitute for olive oil, butter, or vegatble oils in soups, vegetables, smoothies, and even over popcorn. Some users report difference in consistency between jars, but this is probably because it is a natural product. The aroma of ghee can be too strong for some individuals. 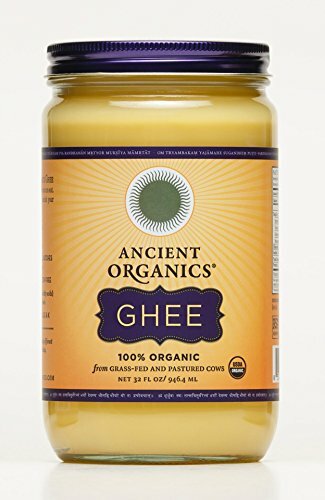 The Ancient Organics Organic Ghee bottles are available to buy on Amazon. This Bulletproof ghee is produced using traditional Ayurvedic methods. This involves using an open flame to slowly heat the butter, then carefully removing the milk solids and moisture. This process leaves you with a buttery tasting ghee that has a naturally rich, buttery flavor that works wonders at enhancing foods and drinks. The high smoke point of 485 degrees Fahrenheit makes it one of the best options for cooking while maintaining all of the vitamins and minerals it contains. This ghee works to protect your body against inflammation, cancer, osteroperosis, and digestive issues. Bulletproof ghee makes an excellent topping over meats and vegetables, and it works well as a sibstitute for butter in coffee and baked goods. Some ideas for use: great addition for Bulletproof coffee, drizzled over meats and vegetables, great as a substitute for butter in baked goods. 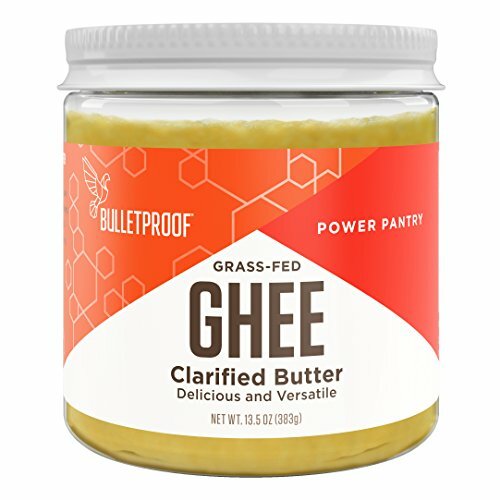 Bulletproof ghee is an excellent source of vitamins, minerals, and acids geared to protect your body, improve digestion, and help you lose weight. The buttery rich flavor is delicious. Sugar and gluten free product. This product is all natural and non-GMO. Made from grass-fed cows’ milk. The Bulletproof Grass-Fed Ghee bottles are available to buy on the Bulletproof website. Viva Naturals ghee is certified organic ghee, made from grassfed cows’ milk. This ghee is created using an ancient Indian technique called Ayurvedic, where it is simmered and separated over an open flame. The dedication put into making this product is evident in the creamy butter flavor, described as a delicious nutty, caramalized flavor. Ghee from Viva Naturals is gluten-free and can be incorporated into Paleo diets. This product is made with only the purest butterfat imaginable, with a silky smooth texture that is perfect for toast, muffins, vegetables, and more. There are less than 2.5 ppm of casein in this product, making it an excellent option for individuals who are sensitive to casein and dairy products. Some ideas for use: sauteing with high-heat and deep frying foods. Product can change from a liquid to a solid, indicating the purity of the ghee. An excellent source of vitamins to help keep the body strong. Certified organic product and made in the USA. This ghee is grain and lactose free. Some user report that this ghee has more of a liquid consistency. Some users have reported a gritty texture at times. The Viva Naturals Organic Ghee bottles are available to buy on Amazon. 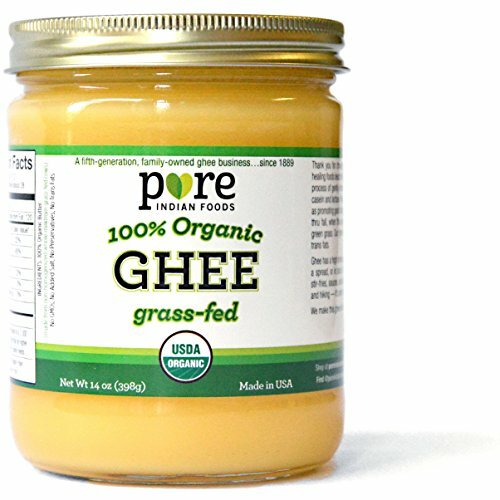 Pure Indian Foods offers one of the most popular brands of Ghee on the market. This product is the first Whole30(R) certified ghee and it is USDA certified organic. Pure Indian Foods is a family owned business that dates back to 1889 known for gourmet quality products. This ghee does not include any preservatives, trans fats, dyes, salts, or any other addatives. This ghee is made only from non-homogenized milk using traditional methods for simmering and separating the milk solids from butterfat. This ghee is only made between the springtime and fall each year, allowing the cows adequate time to consume a healthy diet between seasons. Some ideas for use: stir-fry foods, sauces, and sauteing foods. Quality product created by a fifth-generation family owned business. This ghee does not contain any unnatural ingredients. Makes an excellent substitution for any recipe or cooking method that calls for butter or oil. Great for individuals with lactose intolerance and casein allergies. Ghee has a different smell to butter, which can be off-putting to some. Comes in various textures, which is due to its natural processing, but some individuals do not like gritty textures. The Pure Indian Foods Grass Fed Organic Ghee bottles are available to buy on Amazon. The clarified butter ghee by Vital Ghee is backed with a 100% satisfaction gaurentee. This product is made with some of the highest qualities organic and unsalted grassfed butter. Packed with vitamins A,E, and K, as well as omega-3 and omega-9, this product is recommended by alternartive doctors and Ayurveda health professionals to indivduals for healthier digestion. Vital Ghee is made over a low flame, cooking for several hours in a ghee pot in order to achieve the highest quality results. This ghee tastes great over popcorn, vegetables, meat, and various other foods and drinks. Vital ghee brand ghee helps individuals manage carbs and insulin levels, while providing relief from digestive issues. Some ideas for use: cooking, baking, sauteing, and smoothies. Works very well as oil and butter substitute. A proven excellent source of vitamins and nutrients. A flavorful option with no lasting aftertaste. No large bottle size option. The Vital Ghee Brand Grass Fed Organic Ghee bottles are available to buy on Amazon. I know you were looking for what are the best options, but here is some more detail as to why grass-fed ghee is so good for us. 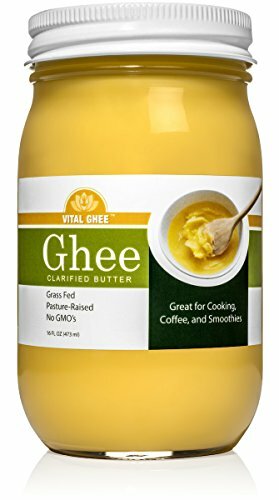 Ghee is a traditional clarified butter. Ghee is made when butter is heated up. The melted butter separates into two different parts, a liquid and a solid. The milk solids float up to the top with the liquid butterfat below. Once these milk solids are removed, you are left with the clarified butter which is called Ghee. High smoke point. Ghee is able to be heated up to 478 degrees, compared to 350 degrees Fahrenheit with butter, giving it the ability to bake, sautee, and roast reliably without losing some of the key nutrients it contains. Lactose and Casein free. This product is safe for individuals with milk allergies. Major caseins and lactose elements are removed through skimming and straining, making ghee an exceptional option for individuals who are sensitive to them. Full of Fat-Soluble vitamins. 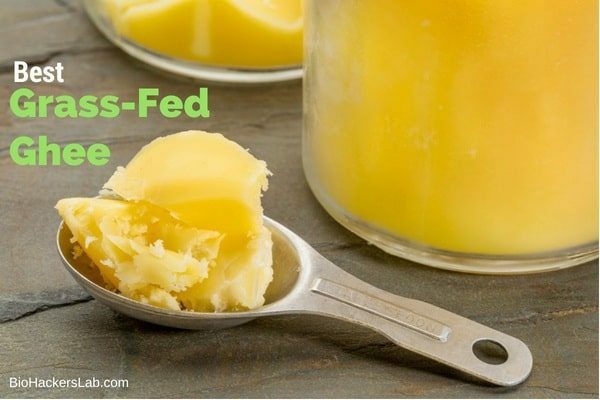 Ghee is an excellent way to obtain extra fat-soluble vitamins. These vitamins can help boost your Vitamin A, E, and K intakes, which are all key components in healthy vision and skin. Additionally, ghee can help individuals with IBS, Crohn’s, or leaky gut syndrome absorb fat-soluble vitamins better to meet their daily goal. Full of conjugated linoleic acid. CLA is a fatty acid packed with health benefits. CLA is found in studies to prevent cancer formation, lower blood pressure, aid in weight loss, and lessen inflammation. Bursting with flavor. Ghee tastes like a more flavorful butter. By straining and simmering out the imperfections, ghee’s flavor is satisfyingly intensified. Due to its strong flavor, you will be able to use less of this product than you would with butter or oil. Improves bone strength. Loaded with K2, ghee helps the body better utilize calcium, protecting you against tooth decay, atherosclerosis, and bone weakness. Full of Butyrate. Ghee is an excellent source of butyric acid, which plays a key role in gut health. This acid helps promote healthy gut microbiome and provides energy to colon cells. Helps with weight loss. Ghee works like coconut oil to promote weight loss by burning other fats within our system. Ghee works to attract fats within the body and remove stubborn toxins. Helps digestion. The butyrate in ghee helps individuals maintain optimal digestive health. Individuals who consume ghee benefit from a stronger gut barrier function. Additionally, individuals see relief from constipation. When To Use Ghee vs Butter? Ghee has a higher smoke point, allowing it to hold the flavor and nutrients even at higher temperatures. Butter has a smoke point of 350 degrees Fahrenheit, so it loses a lot of nutritional value early on. Both ghee and butter have similar nutritional profiles, so either would be excellent when used in moderation. Both ghee and butter have similar nutritional profiles, so either would be excellent when used in moderation. Ghee is a better option due to having virtually no casein and lactose. Butter is a dairy product, so lactose and casein sensitive individuals should not use this product. 2.3 When To Use Ghee vs Butter?